So what if I have a thing for breakfast burritos? ; I don’t have a problem and I can stop at anytime. But, seriously, why would I stop? Are you telling me that just because something has the word breakfast in it I can’t eat it all hours of the day? It’s breakfast time somewhere! I’ve been on a Tempeh tear lately; looking back at my previous posts – they all have something in common -t hey feature Tempeh. What can I say? It was on sale. And, I’m frugal and it’s delicious! 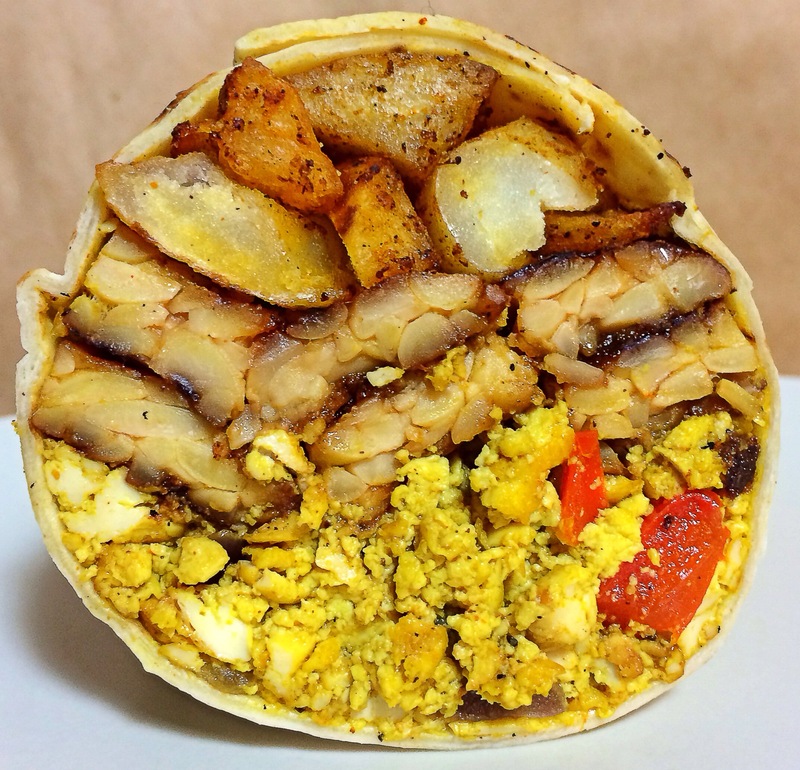 This burrito consists of 3 ingredients, Tofuevos (my version of Tofu Scramble), Seared marinated Tempeh and roasted potatoes. Nice and hearty. Just the thing you need before you start the day anew. Or you know – eat it whenever. You’re an adult. You have a right to party. The corresponding recipes for each burrito filling are below; all you need to do is wrap em’ up in large flour tortilla and you’re good to go. 1. Heat your oil in a medium/large frying pan over medium-high heat. 2. Add your onions and peppers – cook for 3 – 5 minutes, until they have browned. 4. Add your seasoned tofu and cook for a couple minutes – stirring occasionally. 5. Add in your (cooked) onions and peppers – stir to incorporate. 6. Cook until thoroughly heated and browned. This is when you decide how you want your tofu. For a harder ‘scramble’ allow tofu mixture to cook longer and brown evenly. For a softer scramble – heat throughout. 2. Cut your potatoes into 1 inch dice. Don’t worry about some small pieces – they’ll add crunch and texture. 3. Meanwhile, in a large mixing bowl – whisk remaining ingredients together until thoroughly combined. 4. Toss your potatoes into the mixing bowl and stir making sure the potatoes are covered. 5. Lay your potatoes in a single layer in a large roasting pan – I line mine with parchment paper. 3. Place your tempeh in a flat rimmed dish (preferably glass) and cover in marinade, making sure that each part of the tempeh slice touch the marinade. 4. Marinade for at least 1 hour or up to over night. Turn tempeh a few times here and there. 5. Heat your oil in a large flat frying pan over medium high heat; place your tempeh down flat and cook a few minutes per side. You’ll want a little char – but be careful not to burn. 6. While your tempeh is nearing the end of cooking – when you’ve achieved a nice color & char – pour remaining marinade and 1 TBS of water – lower heat to medium and cook until all the liquid has been absorbed.